InsideOut Firewall Reporter is a real time tool that runs in a browser and provides details about Internet traffic that help you make decisions for maximizing your company's Internet usage - contains hacker alerts that not only tells you who's persistently chipping away at your firewall, but also notifies you if your specified refusal threshold is being threatened - supplies employee usage patterns by individual - generates reports quickly by consolidating data in real time - contains 10 major report categories and a powerful filtering capability, offering you more than 150 useful reports and uses a drill-down feature to zoom in quickly and easily on activity during specific time periods at any point in the past. Firewall Analyzer is an agent-less Log Analytics and Configuration Management Software for network security devices. The product is used for end-point security monitoring & analysis, change management, employee Internet monitoring, bandwidth monitoring, capacity planning, policy enforcement, security & compliance audit reporting. Firewall Analyzer is vendor-agnostic and supports almost all open source and commercial network firewalls (Check Point, Cisco, Juniper, Fortinet, Snort, Squid Project, SonicWALL, Palo Alto, etc…), IDS/IPS, VPNs, Proxies and related security devices. Targeted at network security administrators & MSSPs who would like to centrally collect, archive, analyze security device logs, and generate forensic reports. SecureScope is an innovative three-dimensional visualization tool used to discover patterns in information security data and improve the situational awareness of information security officers. Its interactive 3-D display presents an integrated "big picture" perspective of an organization's numerous network security sensors and devices, providing for early detection of network security events and incidents, allowing the user to act quickly in thwarting network attacks. SecureScope visualizes data collected from a single sensor, such as an IDS, or a combination of sensors, such as an IDS, Firewall, Audit Log or ESM systems. ICFMeister is designed for monitoring the activities of the ICF - the Internet Connection Firewall that is built into Windows XP. The information ICFMeister delivers can help you detect hacking attempts and sort out problems with internet-capable programs on your computer. A single installation can harvest ICF log data throughout your network without the need for multiple licences. ICFMeister reads the logs generated by the ICF on your PC and on other XP computers in your network, and presents them to you in a consistent format. Where possible, ICFMeister provides additional information to help make sense of the log data. Hover the mouse over an IP address, and you see the corresponding network name in a tooltip. Hover over a port number, and you get the most common uses of that port. You can filter, sort and reorganize display columns to assist with detailed analysis and data presentation. Floating satellite windows let you minimize ICFMeister to your system tray yet still see the latest data as it arrives. You can export a log in various formats including text, csv, xml, and formatted html reports. You can even publish your logs as RSS feeds. ICFMeister will monitor your logs 24/7, watching out for firewall activity that interests you. Wflogs is a firewall log analysis tool. 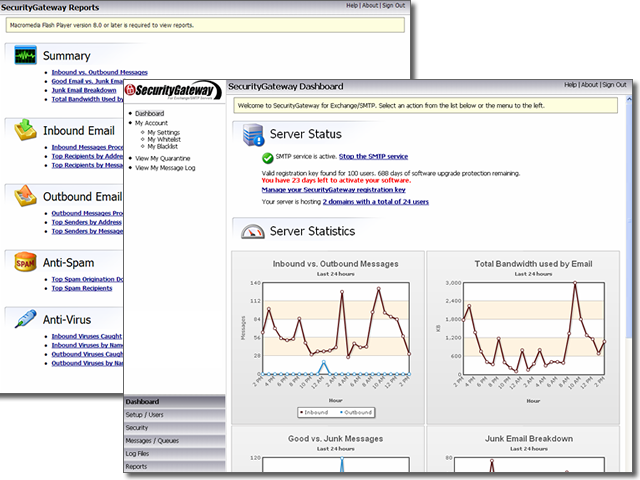 It can be used to produce a log summary report in plain text, HTML and XML, or to monitor firewalling logs in real-time. It is part of the WallFire project, but can be used independently. Wflogs is "libre" (free as a speech, in English) software. It is mainly written in C++ and is intended to run on every *nix system.